Living with cats you learn a thing or two about hedonism. I'm typing this review while Marigold, an exceptionally soft and cuddly three months old tabby, is sprawled on my lap, purring blissfully. She squeaks a little when she feels that the ratio of typing and belly rubbing isn't in her favor, so I put at least one hand back where it belongs: on the kitten. Next to us, all 20 lbs of Buffy are in a similar position. It's a perfect night. The husband cooked a wonderful dinner using oyster mushrooms we bought at the farmer's market earlier today. We tasted a local honey, bought fresh goat milk yogurt for tomorrow's breakfast, did some antiquing and finally got back home to snuggle with the fuzzy creatures. When you stop and think of it, hedonism and perfume are related. Especially perfume as a hobby: the quest for the next amazing one, collecting, indulging. We're pleasure seekers and it feels good. Which is why perfumer Viktoria Minya was spot-on in naming her first creation Hedonist. This fragrance hits the spot for me perfectly. It's an opulent and operatic perfume, all grand gestures and notes, black velvet and gilded embroidery kind of thing. Hedonist is a boozy floriental. Think of this description and what it means to you, then magnify it a couple of times to get the general idea. The fragrance bursts unto the skin with sweet rum and tobacco awash in golden afternoon light. It sounds dramatic, I know, and it is. Soon after that I get equal measures of peach liqueur and honey. Lots and lots of honey. The one thing that keeps Viktoria Minya's Hedonist from being an all out gourmand (more "Drink Me" than "Eat Me") is the opulent floral core that surrounds the velvety peach notes and enhances various aspects of it. The honeyed peach that dries down into a honeyed wood/vetiver somehow has a chypre-like quality. I get why some smell a reference to Mitsouko in Hedonist, but don't expect the oakmoss of yore. Hedonist is a modern fragrance despite the obvious connection to classic French perfumes as well as to big game from the 1980s. It's elegant and rich, of course, and truly smells like something you'd wear to the Met Gala (you'll have a hard time prying Andre Leon Talley away from your neck). But Hedonist is also of the "yummy" school of perfumery, and it's far more cheerful and affable than you might expect of such a layered and textured fragrance. The hedonism in this case is more about opulence than debauchery. There may be a bacchanal around the bend, but unless honey notes go all wrong on your skin, everyone in this party remains (beautifully) clothed. I'm fine with that. Hedonist is a beautiful and satisfying perfume that lasts forever and makes for a delicious date night out on the town. I'm utterly besotted. Notes: rum, bergamot, peach, osmanthus absolute, jasmine absolute, orange flower absolute, tobacco, vanilla, cedarwood, vetiver. 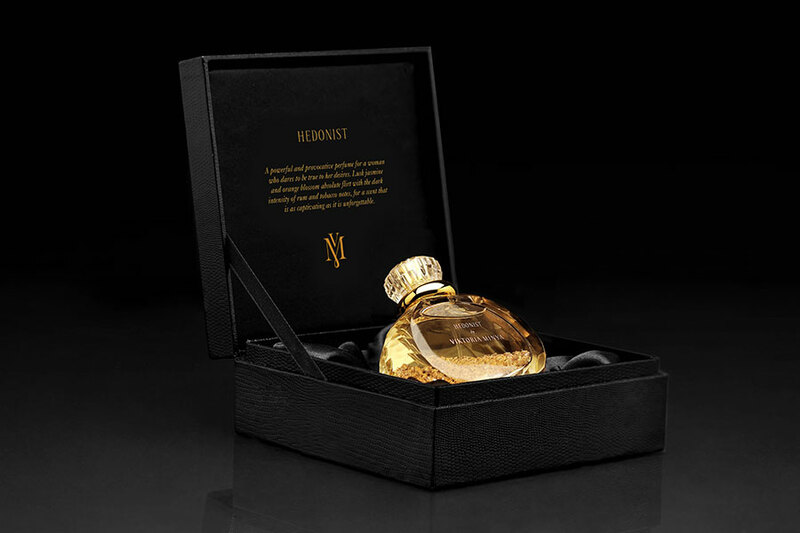 Viktoria Minya- Hedonist ($195, 45ml EDP) is available from Luckyscent. The sample for this review was sent by the perfumer. Photo of Greta Garbo via Straight, Stirred Up, With A Twist. This perfume sounds lovely and rich. I always love a lazy Sunday cuddling with our two furr babies, enjoy your new kittens! "Living with cats you learn a thing or two about hedonism." Can I say how much I love this? So true! I just ordered a decant of Hedonist. Such lovely writing in your review! oooh oooh oooh. Sounds so good on all counts. Peach, osmanthus, vanilla, jasmine and tobacco...this sounded phenomenal when I first read about it. I quickly ordered a sample, and couldn't wait to try it. Alas, it was debauchery, all right, and not in a good way. All I got from topnotes to drydown was unwashed skin (multiple days' worth). It's interesting that you comment on the honey note (which is not listed in the official notes), because honey usually turns to disaster on my skin. Had I read your review before ordering the sample, I probably would not have bothered. Your advice for folks to proceed with caution if honey notes go bad on their skin is well-founded! I regret missing what everyone else is smelling. Hedonist is a miss for me. I am with you on Hedonist - I love it as well - the juicy fruitiness, the tobacco notes, the orange blossom, mmmm, lovely. Looking forward to placing my order! Sounds and looks so lovely.